"Moriyama is the first release on Brooklyn based Palto Flats label by Nagoya-based experimental producer Foodman (Takahide Higuchi). A 5-track 12" focused on deep, tactile rhythmic and offbeat tracks, Moriyama tilts on some of the producer's most dance-friendly work. 'Mizuboro,' (meaning water bath) elicits the feeling of soaking in a tub of warm bassy synth pads, metronomic patterns of woodwinds and skittering percussion suitable for late night winds. Elsewhere, on 'Soudesu,' Foodman experiments with traditional instrumentation & vocal forms to create a special post-ambient/dance hybrid of familiar sounds reconfigured. Named after the district he lives in, Moriyama represents some of Foodman's most direct, accessible work -- a full helping. Foodman is the most internationally renowned artist coming out of the Japanese footwork/experimental scene, and has recently transitioned into more abstract, ambient compositions. RIYL: Panda Bear, Visible Cloaks, Jlin, Acido, Kate NV, 0PN, Kaitlyn Aurelia Smith"
"R. Girardin's Emotional Music is a is a contemporary rendering of synthetic midi-fusion and DAW experimentalism. Drawing links between Rashad Becker's textured compositional approach and the multicultural electro-fetishism of Benjamin Lew (Tuxedomoon), Girardin uses the synthesizer as a spiritual instrument, where the typical motifs of musicality and style degrade in favor of poetic modulation and breath-controlled hopefuls. Emotional Music is a synthesis of both the human and synthesizer's expressive logics; one of internal architectures capable only through external inlets and outlets. Based in Los Angeles, Girardin has previously released music on the Italian label Hundebiss and has contributed to the score of Invernomuto's film Vers L'Europa Deserta, Terra Incognita. Emotional Music is a co-release between NYC's Palto Flats and LA label Zero Grow." 2019 repress; LP version. "Originally released in 1982, Kakashi is another high water mark in the 80s Japanese underground. 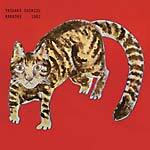 This album, which has gathered cult status in recent years, is the project of musical visionary Yasuaki Shimizu, and considered to be a highlight of his solo career. Shimizu was the bandleader of Mariah, who also saw their album Utakata No Hibi reissued by Palto Flats in 2015. Kakashi offers a similar blend of saxophone experimentations, jazz fusion and ambient dub excursions."